Serviced apartment for rent 1 bedroom, with a balcony on Phan Ngu street in District 1, near Le Van Tam Park, security area, and quiet, convenient traffic. 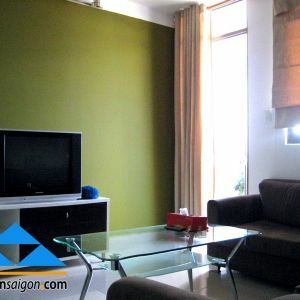 Thien Phu Real Estate for rent serviced apartment with 1 bedroom on Phan Ngu street in District 1. This serviced apartment is designed with a bedroom, a bathroom, kitchen and spacious living room with an area of 50 m2 for rent fully furnished, modern wooden floor with a balcony. This will be the place to meet the demands of your living daily. 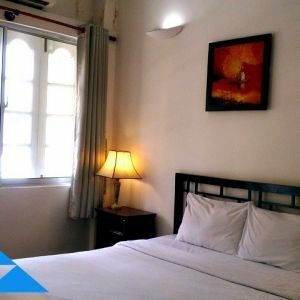 There are fully furnished in serviced apartment on Phan Ngu Street such as a bed, TV, refrigerator, pillows, wardrobe, dining table, kitchen and kitchen equipment. Everything is ready for use when you move in the apartment.